Do you promote your heart health everyday? You can have a lifestyle that promotes your heart health everyday! It is not hard to do and I believe every person is capable of living a healthy lifestyle that will keep their heart healthy. Having a healthy lifestyle that promotes heart health requires a two-prong approach. An active lifestyle to build a strong heart. And, the right foods to supply your heart the nutrients it needs. Your heart is a muscle, and the way any muscle gets stronger is by repeatedly placing a demand on it. Cardiovascular workouts are that demand to build a strong heart muscle. Cardiovascular workouts increase your heart rate while you are doing them. It is recommended that you do cardiovascular workouts 5 times per week for a minimum of 30 minutes at a moderate intensity for heart health. The direct heart health benefits are: lower blood pressure; reduced unhealthy cholesterol and increased healthy cholesterol levels; lower risk for heart disease; reduced risk for stroke. The second aspect to having a healthy heart is your diet. There are may foods that can promote your heart health, just like there are many foods that can promote an unhealthy heart. You have to eat, so why not get healthy eating foods that will help your heart. Plant based foods are the foods that are the most beneficial for your heart as these are the foods that supply your body with required nutrients and pytochemicals. The phytochemicals in plant based foods are the best source of anti-oxidants which is very helpful for the heart muscle since the heart muscle has a very high demand for oxygen. The various phytochemicals also have anti-inflammatory properties, which is very helpful for the heart and in keeping systemic inflammation down that could negatively affect the arteries. Every meal you eat during Full Body 30 Day Vegan Cleanse is a heart healthy meal! This program teaches you how to eat a wide variety of plant based foods that will promote your heart health. As an example, take the butternut squash I made last night for dinner. 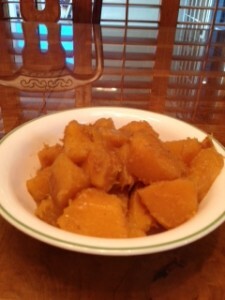 One of my favorite ways to prepare butternut squash, the recipe is in Full Body 30 Day Vegan Cleanse. Reap all the benefits from a whopping portion of Vitamin A, Vitamin C and it’s loaded with potassium, so it’s very good for your heart and muscles. Furthermore, butternut squash provides lots of bioflavonoids and carotenoids which are very helpful for your heart. And, if you need another reason to eat this squash, it is a healthy carbohydrate- our body’s need healthy carbohydrates. You can learn healthy eating habits from Full Body 30 Day Vegan Cleanse. After a day at school, the boys deserve a smoothie that will nourish their brains as well as their growing bodies – I have been making healthy smoothies for them for years. I call this one Passionate Peach. 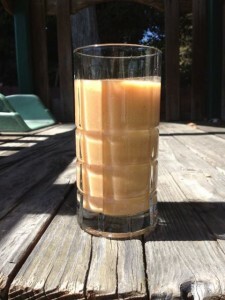 It is made with fresh orange juice, frozen peaches, coconut milk passion mango yogurt, and fresh pineapple. All blended very well in my VitaMix. A thick yummy healthy smoothie for their brains, their body and yes, even to nurture their spirit as this healthy smoothie always brings a smile to their faces! Full Body 30 Day Vegan Cleanse has a number of healthy smoothie recipes that I have made for my boys over the years. As the health of my family is a top priority, even making smoothies stayed in line with that priority. The ingredients I use are only healthy ingredients and I never add sugary ingredients, there is just no need to since fruit is sweet enough. I make different healthy smoothies so that the boys get the benefit of different nutrients from the different ingredients. I give the boys healthy smoothies to get extra calories in them. Both of them have been very physically active in different sports from a young age. I have always wanted to ensure their bodies were given the nutrients it needed after all the demands they placed on their bodies. Drinking healthy smoothies has certainly accomplished both of those needs and is a much healthier choice over sodas and energy drinks. Whether this healthy smoothie is for your kids or for you, it will bring a smile to those who get to drink it!